Les Arcs/Bourg Saint Maurice is faithful to its alpine heritage. Set in a superb and pristine natural environment, the resort harmoniously blends tourism and traditions. Les Arc has some of the best skiing terrain in the Savoie region; it's the perfect playground for skiers and boarders of all abilities. The Resort has more than 1.5 million skier visits annually on 692 hectares of ski runs. The Village at Arc 1950, one of several villages at the resort, boasts an altitude of 1950 meters, where the snow starts falling earlier in winter and stays longer in spring, making it possible to enjoy a full array of winter activities in the most desirable of conditions. The village itself is situated at the base of its own ski mountain, and surrounded by stunning scenic panoramas; in the distance, the peaks of Mont Blanc mark the horizon, and nearby, a hundred year-old pine forest, majestic glaciers and a spectacular waterfall. The Village at Arc 1950 is a fusion of French culture and modern design, of the rustic and the refined, winter sports and summer pleasures, creating an alpine experience like no other. Full of character and old-world charm, the village retains a sense of local history, yet caters to the needs of this new millennium. Discover the Savoyard culture through its baroque churches, unique cuisine, artistic tours and museums. Guided tours through the local villages are offered, detailing the traditions and local legends unique to the region. With museums dedicated to costumes, minerals and apples, the Savoie region is proud of its well-preserved heritage. With influences from French and Italian cooking, the Savoie region is the birthplace of a unique and flavorful cuisine. Dishes such as Savoyard fondue, pella and tartifl ette are created from the distinctive blend of deeply colored wines, richly flavored salted meats and strong tasting cheeses. Many local restaurants still uphold these traditions and offer a wide selection of local favorites. The quality and presentation of Savoie fare is justly ranked by gourmets as one of the finest in the French provinces. With cultural getaways, itineraries for food lovers, walking and hiking trails, tennis tournaments, and plenty of golf, Les Arcs is an ideal summertime escape. The wide-open spaces and variety of landscapes beckon nature lovers to explore. Discover the genuine values, friendly atmosphere and traditions to be shared as well as the natural heritage and miles of footpaths. Imagine glistening snow topped peaks surrounded by blue sky, an emerald lake nestled amongst fir trees and a village built in stone and wood. There's also grand pine trees, three to four hundred years old, symbolizing the majestic beauty of the Alps . Enjoy the European thermal spa, outdoor swimming pool, an assortment of eclectic restaurants, animated cafes and specialized boutiques. With so much to see and do at Les Arcs, you'll need more than a week to take it all in! 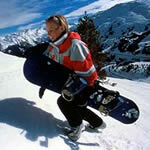 For more information on Les Arcs, click here. To view the above document you will need the Adobe Acrobat Reader. Les Arcs is located is in the south eastern region of France, in the Savoie region. Neighboring cities include Lyon, Geneva, and Albertville, home to the 1992 Winter Olympics. People traveling to this region can fly into local airpots including Lyon, Chambéry-Aix, and Geneva and take a regular shuttle to the resort. Roads to Les Arc have been upgraded due to the Olympic games and offer easy access to the resort. Regular train service is also offered to the area. Reference www.lesarcs.com for more information. France is six hours ahead of Eastern Standard Time. To use any North American electrical devices, you'll need a voltage transformer and a plug adapter. France uses the Euro as its currency; most cities and small towns have ATM's. All non-residents require a passport to enter France and are entitled to bring home $800 worth of merchandise, duty free.